Aeon MQ Krypton Mod skin has been updated for full compatibility with Kodi Krypton 17.0/17.1. Please note that the biggest change in this Mod, compared to earlier versions is that many skin textures are configured in the "Skin Settings" menu on the "Icon/Backgrounds" tab. This includes add-on skin themes and styles which previously were included in the Aeon MQ Extrapack add-on. This add-on is no longer needed nor used and can be uninstalled via add-on browser. a. If this is an upgrade I recommend making all changes from within Estuary default skin. b. If you have installed any version of the scripts used in providing skin info for movie sets, I recommend you uninstall these and download the latest versions to install from zip. These are "script.skin.info.service" and "script.moviesetart". Save the download file to a location available from within Kodi. In Kodi, navigate to the add-on browser and select install from zip (you may need to first change the add-on settings to allow installing from unknown sources). You will now see an entry in "my addons" for the repository. 3. (optional). In add-on browser go to install from repository and select the Aeon MQ5 Kryptonmod Skin Repository. Click through "look and feel" and "GI sounds" and install Aeon MQ5 Krypton Sounds. After installing, navigate back to "image collections" and install Skin Styles - Aeon MQ. 4. Enter (or navigate back up in) add-on broswer install from repository and select the Aeon MQ5 Kryptonmod Skin Repository. Click through "look and feel" and "skin" and install Aeon MQ 5 Kryptonmod. Installing requires several "dependency add-ons" which will be installed first, following by installation of the skin itself. Sometimes problems with Kodi file mirrors results in a dependency failing to install due to time-outs. If this happens wait a couple of minutes and try to install the skin again. I recommend you do not switch to the skin at this time. 5. (optional). 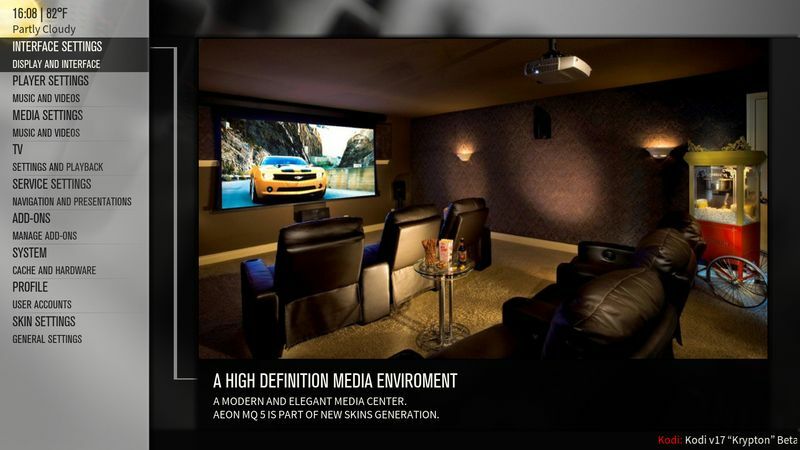 Install from zip add-ons used for movie set information displays. This script has been updated for Krypton (version unchanged) so make sure you download the current version. This script indicates it is for "Frodo" but works in all later versions of Kodi. 6. In Kodi interface settings/skin, select "Aeon MQ 5 Kryptonmod skin". On first run the skin will take some time to build menus for the home window. When all steps have completed, Kodi will switch to the new skin and you will be taken to the home window. 7. I recommend you exit Kodi and restart. Normally Kodi does a good job of writing all skin settings to file, but this step just makes sure that it is done before you start customizing the skin. 8. I recommend you customize the skin icons/backgrounds first. This is a new tab in the skin settings. In this tab is a list of possible icons and background types that the skin supports. In some cases Kodi includes the image add-ons as part of the base install. In other cases you can download and install from the Kodi (or other) repo the image types you want (example, weather icons and fanart, studio icons, etc). After these resource add-ons are installed you can select them for use. You can also switch your GUI sounds, but you need to do that from the "system" settings, not "skin settings". After you have completed this step, you can make other skin settings as desired. For the most part it works as it has in the past. For "custom home menu" there is now a button/submenu available for displaying the music library "roles" view. If you copy custom home menu items from Jarvis, you may find certain menus don't work. This is due to changes in Krypton. In the "customize home menu", you can replace the non-functioning menu item with the same one from the menu selection panel, and the working version will replace the Jarvis one. Note that besides the new music "roles" view, an interesting Krypton feature is the "player tempo" control which allows you to playback video with sound in the range 0.8 - 1.5 of normal speed. To make this available you need to change the video player setting to "sync playback to display" in the settings. (Note that if you do this, audio passthrough no longer is available so you need to consider this.) The full screen video OSD has buttons for "tempo up" and "tempo down", or you can use keyboard/remote (may need to edit your keymap file). There is also a new OSD menu betton for "CMS" controls, if your monitor supports this. Numerous changes were made in live TV, in particular EPG and timers, so you might need read the Kodi wiki on the differences. Also, attached controllers are managed differently. Again consult the wiki for more info. I am working on a 1080 version of the skin. This will be a separate install when available. A Leia (Kodi 18) version of the skin is also available. As always, the latest files are available on the GitHub repository as soon as I commit them. I new release build 9.2.2 of Aeon MQ5 for Kodi 17 (Krypton) is available. This update is intended for use in Kodi Krypton Beta 6 release and later nightlies. Add-on "TV Tunes" is no longer supported, but the code is available (but commented-out) in the xml files. Add-on dependencies in the skin have been modified. The Kodi official "playalbum" add-on has been added as a dependency. This update is intended for use in Kodi Krypton Beta 1 release and later nightlies. It is available from my release section of github. If you have my Aeon MQ5 Kryptonmod repo installed in Kodi you should see the update, otherwise download the zip and install fro zip locally. everything (almost) is there but you might have to hunt around for it until you get used to the new Krypton style. 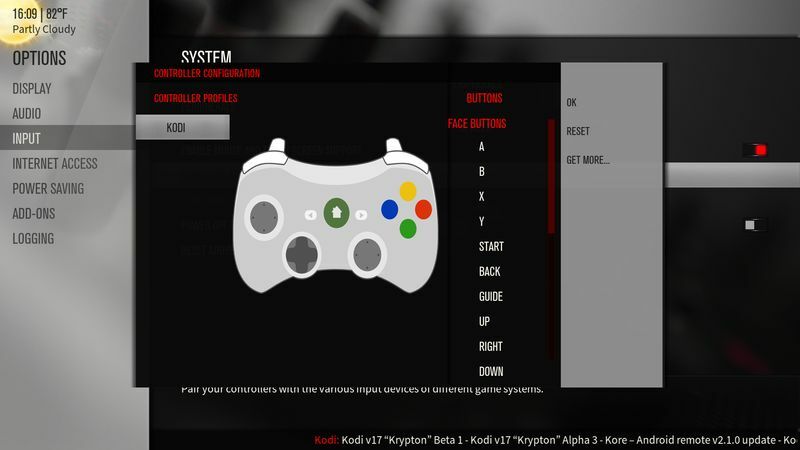 The main function changes is that to turn on/off game controllers / joysticks and live TV, there is no setting any more; instead you have to enable or disable the appropriate add-ons in the add-on browser. I have released a new build of Aeon MQ5 for Kodi 17 (Krypton). This release is for Kodi 17 Alpha 2 (Krypton) release. Note that Kodi settings layout has been significantly updated for Krypton, so you will have to re-learn where specific settings are located. MQ5 for Krypton relies on "resource packs" for various things such as GUI sounds and icons (weather, genre, studio, recording labels, etc). These must be downloaded from the official Kodi add-on repository and installed/selected via the Aeon MQ5 skin settings. Kodi Krypton makes many "under the hood" changes that affect how skins work (but may not be visible to the user). I have incorporated all these changes as best I could but there could be some bugs along the way. I have been tweaking various layouts to ensure the "massive font" option displays well. In some cases this may make the "default" font less than perfect but I feel the trade-off is worthwhile (my experience is that the "massive" font is mandatory for using Kodi in a living room environment). As always, download either zip to a local location and use Kodi add-on browser to "install from zip". If you install the repo, you will get updates (auto or notification per settings). Download the file skin.aeonmq5-9.1.15.zip from that page. This can installed via "install from zip" in the Kodi 17 addon browser. Great scott! Keep up the good work! New build 9.1.15 is up (see first post). This is required for the latest Kodi 17 A1 builds (at least from 0129) because of numerous Dialog Window changes. (9.1.14 will not load in latest Kodi builds). Working very good on Krypton,thanks. Is there a way to incorporate color flags with it? I need to do that on both Jarvis and Krypton. It's pretty much on top of list. Scott, a big big thanx since the nightlys are a must for some Android users because they have implemented now proper passthrough via googles API. As a wish - is it possible to create a repository for autoupdating? Why does this thread have a 1-star rating? Although I do appreciate the effort, I am wondering why you're modding MQ5 instead of the newer MQ6? Especially now that Marcus is only working on MQ7 and he probably won't release MQ6 for anything newer than Isengard or perhaps Jarvis. Since MQ5 was made for Helix and MQ6 for the newer Isengard, I'd guess that MQ6 would be easier to adjust to Krypton, since it would already support more newer features or GUI demands? (2016-02-03, 15:19)willemd Wrote: Although I do appreciate the effort, I am wondering why you're modding MQ5 instead of the newer MQ6? Especially now that Marcus is only working on MQ7 and he probably won't release MQ6 for anything newer than Isengard or perhaps Jarvis. Feel free to mod MQ6 if you like. MQ5 was made for Gotham. Since then I am maintaining it. MQ6 now has many mod versions out there with enhancements, so one question is just to update stock MQ6 v 3.3 or add in the various mods that people are using. But since MQ7 is being developed, I assume it will have a public availability for Jarvis before long. Plus I think MQ7 may be a 1080 skin (might be wrong on this). As a result I am not highly motivated to spend a lot of time studying the MQ6 code, while I have a pretty good handle on MQ5. I do this mostly for myself, so I can test out new stuff in Jarvis and now Krypton. I make it available if any one else can make use of it. Unfortunately due to the Kodi development policy of RERO it is hard to spend a lot of time with MQ6 since now I am working on Krypton. I would have to backport all the Jarvis stuff (non-trivial) as well as now Krypton to get MQ6 working. TBH, other than the new widgets on the home window and poster-lite viewmode I don't see anything game-changing about MQ6 except a little better on how to enable and use viewmodes, and some better layouts for full screen music. Not saying it isn't a nice improvement. So that's my thinking. Thanks for reading. As requested, I have a Kodi 3rd party repo setup for this version of the skin, so you can use this to install and update the skin if you like. This link is to the release page on github. From this page you can download the zip for either the repo or the skin itself as you prefer. As always, you can navigate the githb repo and fork/clone the whole thing or look at the commits and copy/replace any of the skin files since last release (note: every skin file has the release ver in the comments header so you can ensure you are getting any files you need). This latest release seems to be better with some important bugs fixed! Now you can switch skin via settings (with confirmation dialog appearing) and also it has something fixed that tv showtime addon is functional when using this skin. Thanks! Thank you very much for your mods. Are you still actively supporting your Jarvis mod specially in regard to Live TV and PVR? I use your MQ5 Jarvis mod in my main PC with Jarvis RC3 and Isengard final in my HTPC waiting for final Jarvis to move on Krypton nightly. Jarvis is taking a very long time to be final with the now 5 weeks delay, at least the RC (RC3) released today fixed one of the 2 remaining open tickets. Scott, thanks for your work. I am having an issue installing, I have installed from the zip and the repository is listed. However the skin does not show up only the GUI sounds. Is it down right now?